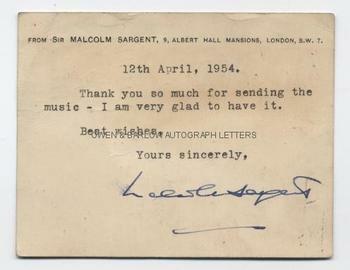 SIR MALCOLM SARGENT Typed Postcard with autograph signature. British (English) conductor and composer. Typed Postcard, Signed. 9 Albert Hall Mansions, London, SW7. 12th April 1954. 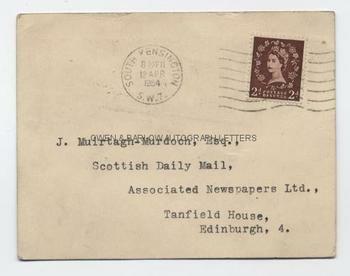 To J. Muirtagh-Murdoch. "Thank you so much for sending the music - I am very glad to have it. Best wishes," etc. Approx 4.5 x 3.5 inches. Very good. Sir Malcolm Sargent (Harold Malcolm Watts Sargent) is generally regarded as the greatest British conductor of choral works. He was the co-founder of the London Philharmonic Orchestra but is probably best remembered as the conductor, for many years, of the Henry Wood Promenade Concerts and the lightness of touch which he brought to 'the last night of the Proms', which endures to this day. J. Patrick Muirtagh-Murdoch was a pseudonym used by composer and lyricist John Murdoch and Liam O'Hara, authors of 'The Daughter of Rose of Tralee', etc. Malcolm Sargent writes to them at the Scottish Daily Mail.